ironment. Orphans who age out without support are much more likely to be trafficked or abused. With your help, teens like this one are not “tossed to the streets,” but, instead, have support, love, and a much brighter future. “Sarah” used to worry what would happen to her after leaving Dai Loc Orphanage. Her mom died when she was 2 years old. Her father, who was mentally slow, put Sarah in orphan care over 10 years ago. He, too, has now died. “Who is going to help me when I have to leave here?” Sarah agonized. But, thanks to you, Sarah has a bright future. She is studying to be a kindergarten teacher at the college in Da Nang. Orphan Voice staff talk with her often, and encourage her in pursuing her dream to be a good teacher and to one day have a private kindergarten school of her own. Sarah is grateful for the provision and protection she receives from you, allowing her to live at Victory House. assion for them in heavenly measure. Victory House is an aging-out ministry, and also part of our trafficking prevention initiative. Be a part of this redemptive work with your gift HERE. Or mail your support to Orphan Voice, P.O. Box 910410, Lexington, Kentucky 40591. Trinh was born with cerebral palsy. When she came to us in 2010, she was very small. The muscles in her mouth were so rigid, she could barely eat. Her neck was weak. She couldn’t lift her head, sit up or speak, and she had no feeling in her grossly contracted limbs. Trinh’s mother was so sad that her hair was falling out. She thought Trinh was going to die. But perseverance pays off! 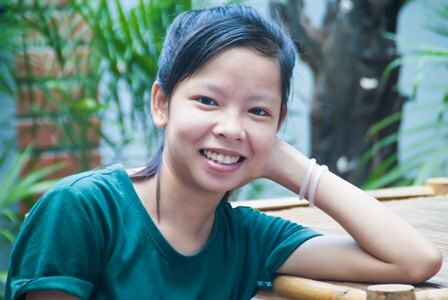 Though it’s very far from her house, Trinh’s mom brings her faithfully to the Center. She has to ask a relative or friend to carry Trinh as she drives the motorbike. But she always makes it, even if it’s raining or extremely hot. Trinh also has a twin sister with a milder condition. But Trinh’s mom does whatever it takes to get her the help she needs. 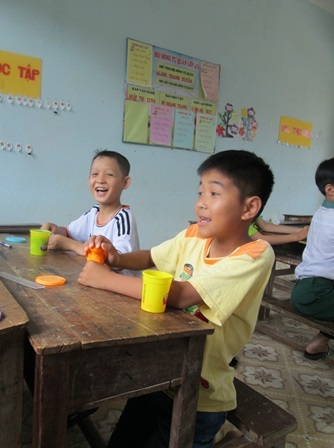 Trinh gets more than therapy at Phu Ninh Center. She is loved. She is hugged and cared for in the arms of Orphan Voice staff. 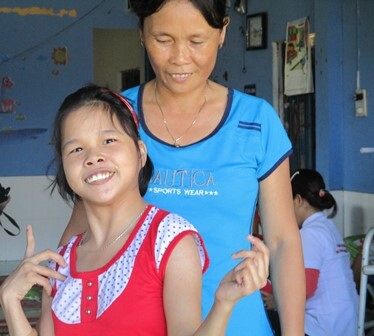 Her mother is also faithful to give therapy at home every morning and evening – first massaging her neck, then helping Trinh sit with support, and finally standing. In 2011, Orphan Voice gave Trinh a walker. She was so excited, and practiced very hard. Soon she was able to walk to the rice field, see the countryside, and open her view of the world around her. None of this life-changing work is possible without you. 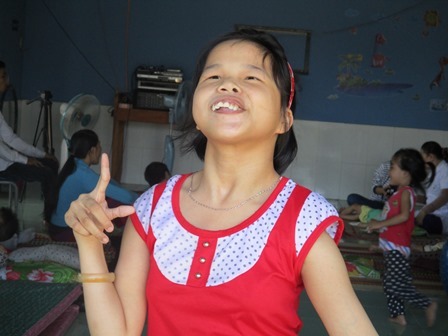 Support Special Needs HERE to help a child like Trinh know love. Orphan Voice’s work to help parents provide for their children has taken many forms over the years. We have provided business training on how to operate a grocery store, and with the training, start-up funds for purchase of stock. At other times, we purchased pregnant sows and helped parents build sheds to house them and their soon-to-arrive litters. Families benefitted greatly. We are most excited, however, about our newest income generating project for poor parents. Have you heard of Moringa Oleifera? a.k.a. the drum stick tree, the ben oil tree, or the horse radish tree? Don’t feel bad if you haven’t; I hadn’t heard of it either. Orphan Voice staff learned of the drum stick tree in their continuing efforts to help parents keep their families together. The plant is very nutritious and almost all of it is useful. Very little is thrown away. It contains huge amounts of protein, vitamin B-6, Vitamin C, iron and other nutrients. Some call it a superfood! Our staff brought this project full circle when they found a Vietnamese company which will buy the plant! We now have a market! 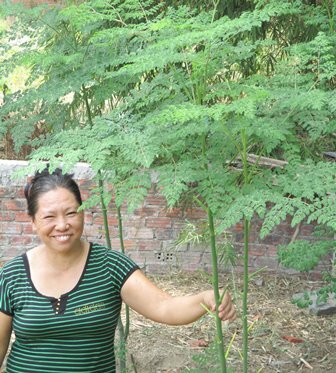 Meet our first family to grow moringa oleifera. This mom is excited about raising and selling a plant that will ensure that she can provide for her children! There is no orphanage in this family’s future! 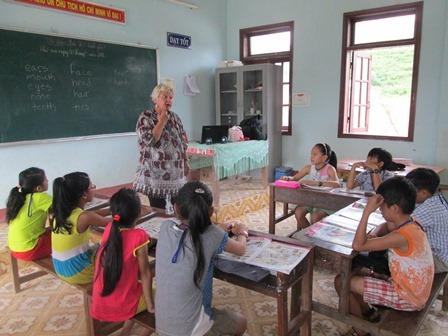 Jennifer Stebbins spent her youth and teenage years in Vietnam where she learned the language and loved the people. Jennifer’s adult life took her back to the States where she raised a family and worked as a social worker. Vietnam, however, never escaped her heart. Four years ago, Jennifer returned to Vietnam. 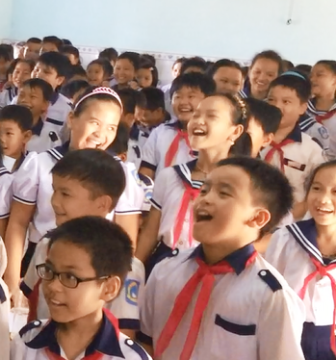 Just last year, she realized a lifelong dream by moving to the Highlands of Vietnam to teach English. You can tell that she loves her new job and that the children love her. We are so blessed to have Jennifer on our team! This is fun. But it isn’t child’s play. Students attending the More Precious Than Goldseminar learn very valuable lessons – lessons that can save their lives. They discuss topics such as: knowing who your true friends are, choices and consequences, traffickers are real, and ways to stay safe. They learn the importance of being patient, becausetraffickers prey on their dreams, promising a better life right now, if you will only listen to them, trust them, go with them. 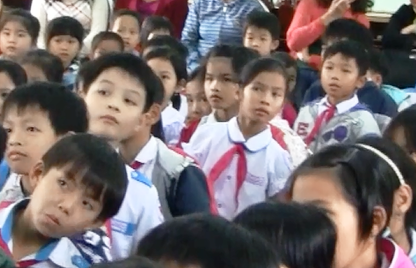 This eye-opening seminar is full of truth and wisdom to protect these innocent children. Because of your support, these precious ones know their value. They are more precious than gold. And so are you! If you have any doubts, just ask the One who made you. You are unique, valuable and dearly loved! This vital ministry needs additional support. Your gift HERE to Trafficking Rescue and Prevention will save a child’s life. Please be generous.